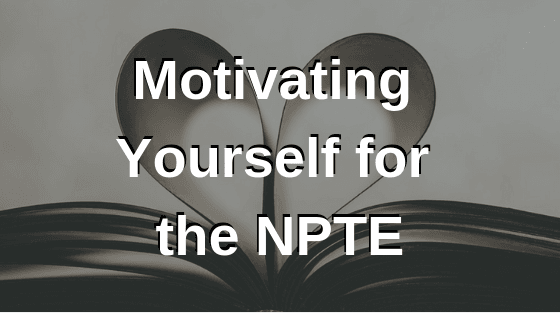 How do you motivate yourself to study for the NPTE? Well, how would you motivate a patient that’s not interested in doing their home exercise program or coming to therapy? You know it’s good for them, yet it’s like pulling teeth for them to just do the simplest thing! It may be like negotiating back and forth: if you do this, you can do that later. When I was asked by a candidate in my course, I then turned around the question, “Well, what’s your reason for getting into the physical therapy field? What’s your drive to get you to study and learn for the National Physical Therapy Exam? Why do you want to help someone get better?” That’s going to be the key to get you motivated. It’s an exercise to search within yourself to help you push through the times when you need a pick-me-up. When you can make the reasons personal, you can refer back to them to remind yourself why you are studying for the NPTE. Think of three to five reasons why you want to be a physical therapist. The more personal your reasons are, the easier to motivate yourself to study for the NPTE! It’s easy to do something for a short period of time when there’s an external motivation and that is, practically, instant gratification. However, to have to do something consistently on a daily basis over a longer period of time needs a really deep internal motivation to get you to do things you really don’t want to do – which is to study. When preparing for the NPTE, pretty much anything else is going to be far more interesting than picking up a study guide and thinking about this dreaded exam. Take a moment to think what will motivate you to study and to learn how to help your patients get better. This is where it’s about your NPTE mindset – it’s about making it a game. How can you change the situation to where you can actually enjoy the challenge of what you can learn today? What can you accomplish? What can you tackle and be proud of, without having to be dragged into studying? There’s more to the NPTE than just knowing the content material. Most of the NPTE tests your mental and physical endurance, as well as your mindset. Don’t let the PT exam beat you at this game, let yourself build up confidence and get into the zone. It’s so much easier to procrastinate, so what I do recommend is starting with something that you like the least in the NPTE and getting it done first. That way you don’t have to dread it anymore and can look forward to learning something more interesting. It’s like a reward. At the end of the day, reflect on what you have learned by making brain dumps; it’s similar to a recap. This way you are thinking about the information and preparing to recall the information at a later time with ease. How would you motivate a patient to do their exercises or treatment? It’s back to understanding their goals and taking steps to accomplish that. Your treatment plans will be broken down into manageable chunks to facilitate each session. Sometimes, it’s educating about the importance of why physical therapy should be done or what the purpose is. Other times, it’s about reinforcing and showing how the treatment is done. Then, there will be times that the treatment is about supporting and motivating the patient to keep going. Whatever your reason to be a licensed physical therapist is, you’ll want to know your why’s to keep you motivated about studying for the NPTE.